Summary : For a bagged tea, this one is really good and surprisingly strong. Not quite on par with a good loose leaf peppermint tea, but it does come close. Review : I have a very big weakness for Peppermint. As such, I can never pass up on the opportunity to try out a peppermint tea. And while strolling through the bulk foods section of my local supermarket, I came across a number of stash bagged teas sold individually - not by the box. At nine cents a piece I couldn't pass this up, so I walked out the door with about a dozen different Stash teas. 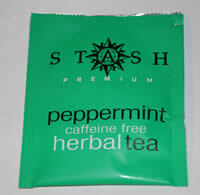 The Peppermint Herbal Tea from Stash has a wonderful peppermint smell when pulled out from the foil wrapper. And the taste did not disappoint - much to my surprise for a bagged tea. For those concerned about their caffeine intake, you will be pleased to know that this peppermint tea is also caffeine free, too. The peppermint for this tea is grown in Oregon. This is no surprise, since most peppermint is grown in the Northwest United States, particularly Oregon and Washington. The sunny summers, mild and wet winters combine to make the NW United States "the spot" for growing mint. This particular tea is not labelled as organic. However, this peppermint tea has nothing added to it, according to Stash. Stash purchases the peppermint leaves and then transports them to one of their North American facilities where the leaves are packaged. Nothing is added to the leaves that would change the taste. The one very noticeable trait about Stash's Peppermint Herbal Tea is that it has an very strong, peppermint after-taste that lingers. People, like myself, who love peppermint will absolutely love this after-taste. Note, however, that this peppermint tea is remarkably similar to peppermint candy in one way - this tea is very sweet. Indeed, it is one of the "sweetest" teas I've ever tasted. And for this reason, it has become one of my favorite teas, too. For those who are not familiar with the qualities of peppermint, peppermint is an ideal after-dinner drink as it helps aid indigestion. Peppermint can also be helpful in mitigating headaches and migraines. In other words, not only does this tea taste excellent, it is also a wonderful drink to have right after-dinner - particularly if your dinner was a large one. Overall, people who enjoy peppermint and are in the mood for a sweet-tasting tea will undoubtedly like Stash's Peppermint Herbal Tea. I highly recommend it. Recommendation : Yes! For a bagged tea, the peppermint tea from Stash packs quite the punch and has a great, lingering after-taste. Brewing Instructions : Pour boiling water over the tea bag. Let steep for about 4 minutes.